So how did it get to this? Where people fill gaps where love could be? With the next Iphone, Ipad, designer clothes and labels galore? When did consumerism become the source of well-being people are looking for? I know many people struggling with this recession and I know it is tough going for many people, but I see it as a huge wake-up call to get our priorities right. When parents and entire families consume like swarms of flies the next ‘best’ thing, and families no longer spend time together, something is seriously wrong with society. When people mainly communicate with sons and daughters or partners through text messages, Facebook and the internet, something is wrong; and when people talk to one another on computer when they are in the next room something is seriously out of balance in the world. This is why I feel that this recession is a good thing for some people in society. Has Consumerism Become A Plague? 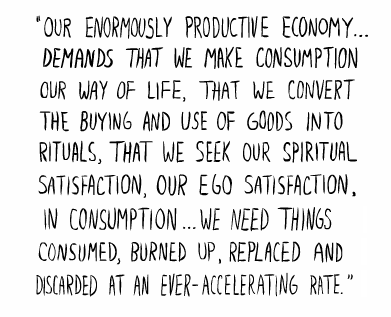 Consumerism has, in my eyes, become a plague on the natural well-being of global society. This generation is feeling the effects of recession as a panic that they are unable to get the next technology or other material possession. Possessions are beginning to possess people instead of the other way round. The definition of poverty being termed as not having the next ‘in’ thing appals me. My best friend, who is in his 70’s, tells me how society has changed, in that poverty in his generation was more about whether you could afford to eat or have shoes on your feet. Compare that to the panic and fear of the youths of the London riots, frightened of not belonging or fitting in without the latest Nike or Converse trainers, or for many the next smartphone. My friend’s generation may have had identities based on a high work ethic and family values and now people base who they are on how much stuff they have. This recession will be a wake up call to many. Many will not cope because the strength of their identity is based on all that ‘stuff’. The ‘lucky’ ones will question their worth and hopefully discover a new sense of value and appreciation for the basics in life and spending money will become valued and deeply appreciated. And of course there are those who will keep up the level of consumerism (keeping the money flowing and the retail sectors going) through increasing loans and using credit cards. I can only imagine life is like a pendulum. Right now we are swinging between the extremes of change. At one end are the consumer-driven, status-driven people who are buying stuff to fill the hole where love can be. And at the other end, those deeply experiencing poverty. AND both are experiencing poverty. One has ‘stuff ‘ but is poor of heart, and the other does not have the ‘stuff ‘ and feels lacking of the love they believe the ‘stuff ‘ will bring. We all need to find a balance. On my own spiritual journey I have swung between both extremes and I notice that the get rich quick schemes and the success coaches/channellers/create your reality teachers, are often encouraging the consumerism side of life and less of the love side. It’s understandable as so many people in the West measure worth through money, status and possessions, so selling love doesn’t sell as many bottoms on seats for those motivational speakers out there. To me, money and material objects are only of value when we feel of worth, exactly as we are in the first place. If we feel lack-full prior to the ‘stuff ‘ we will feel lack-full after the ‘stuff ‘ arrives. So why not feel FULL of presence, FULL of soul, FULL of love and appreciation now? After spending a week in a busy city (my birth city of Newcastle-upon-Tyne), last week, I recognise how much value I place on the simple things in my life. Nature, walking, pencils, pens, conversations with friends, stroking a cat, drinking a lovely warm coffee and breathing in fresh air. Money is something to be valued and deeply appreciated and for me, using it to ‘experience’ life is far more rewarding than gathering stuff. Any stuff I gather is useful stuff. It adds to my life and brings rewards on a heart level. Does your stuff do the same? How do you feel about the recession? Is it affecting you at all? How are you managing? And if you feel lacking do you fill your inner void with ‘stuff ‘? Previous Post Do You Still Have The Explorers Heart? This is a topic I have a lot of interest in, I haven't really got anything more to say but I do agree that the recession can be a wake up call for our country and I do hope people heed the message. I think that people will cling to their luxuries as long as they can (ie cars) but some may have to do without for a while. In some ways maybe the previous generations were more clued up .. I agree with you 100 per cent! The possibility of another recession has me thinking twice about the purchases I make. I can get easily swept up in consumerism and my ego takes me for quite the ride! I try to remind myself that these things I covet (designer bags, shoes, luxury cars) only have worth because the society I live says they do, but the things that cannot be bought (such as health, happiness and love) are far more valuable. Hi everyone, sorry for delay in responding as you can see have been playing a lot with the structure and layout of blog. Andy B, Yes the previous generations I feel certainly were more clue up and less dependant on technology. It makes me wonder about the 'myth' of Atlantis. Of which I don't feel was a myth. To me a continent that became dependant on technology which perhaps destroyed itself because of it. Makes me wonder where we have decided to change this through a recession that opens our eyes wide to whats really important? Simone, Totally, this is what my parents said and say to me. Me too, I was very materialistic, but I had no sense of value of my own worth. Less and more simplicity has shone a light on my true value and worth and maybe this will happen for others too. Julia, how true. I am having a 'natural' Christmas this year and I am making all of my gifts and bringing nature indoors. I place a lot of love and value into these gifts and so to me they have more worth than going to a shop and taking something off a shelf and popping it in a bag. My landlady was telling me her husband has 30 pairs of trousers unopened with tags still on because they let their daughters buy Christmas gifts they are not into. She has the same. And today she was about to throw away a bag full of frozen food because it had been opened but its best by date was not until 2012. Since embracing simplicity in my life I leave very little waste now. Apparently its just over 8 million tonnes of food (worth 10 billion pounds)is food that is thrown away each year by households, supermarkets and institutions. AND I consider this and think "a lot of people with nothing in this world and all this waste?!" ludicrous. Life is worth exploring and I am really starting to appreciate every last thing in life.